A lobby has scoffed off at Coalition for Reforms and Democracy calls for a referendum saying it is a waste of time and resources. The lobby dubbed Mururumo na Uhuru Mashinani has said the country does not need a referendum at the moment to solve any issues bedeviling the country. Led by the lobby chairman Caleb Warari, the lobby said the opposition should use the constitutionally created institutions to air their grievances and direct their petitions. “The opposition’s call of a referendum is not genuine, they just want to create unconducive environment for the governing of the country in order to discredit the government before to the people that it has failed. The people of Kenya should say no to their mission,” Warari said. Warari accused a section of opposition leaders of inciting Kenyans during their rallies by saying they would storm State House and eject President Uhuru Kenyatta. 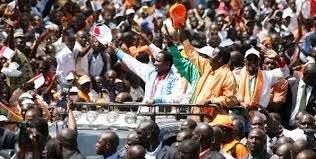 While addressing Saba Saba rally at Uhuru Park, the opposition called for a referendum for Kenyans to decide on 13 issues which they said are burning to Kenyans. The lobby alleged Cord’s call for referendum is not genuine but a ploy to hoodwink Kenyans to get political mileage and incite citizens against the government. “We feel the country does not need a referendum to solve any outstanding issues at this moment. The opposition should use the laid down structures and institutions on any issues they have. He alleged the aim of the opposition is to make the country ungovernable with a view of making it hard for the government to deliver on its promises. Wilson Njenga the lobby vice-chairman said holding a referendum will not solve any problem facing the country.